The Destruction of Pompeii and Herculaneum by John Martin (1822). Angel of Grace by Ryan Yee. As we prepare ourselves for the War of the Spark, the upcoming Magic expansion scheduled for release on May 3rd, it is worth noting that the set is going to include an unprecedented number of planeswalkers. The official word is that every booster pack will include a planeswalker. There will be 36 in all, none of which will be reprints. This means that most metas will probably see an increase in the number of planeswalkers they have to deal with in the average game. Some of these planeswalkers will be underpowered. When the Dominaria set flooded the market with legendaries many of them weren’t exactly game-breaking. I’m looking at you, Arvad the Cursed. Arvad was doubly-cursed. He was cursed with a relatively tame ability and then cursed again with a name that will always make me want to call him Aardvark the Cursed. Today’s column is not about how they should have put Arvad in Gruul, made him a flip card and given us our first truly great were-creature commander by making him a were-Aardvark. Today I’m going to be exploring ways you can prepare for the upcoming flood of planeswalkers that are going to hit us in late April. Sure, the set drops in early May, but the Commander Rules Committee has told us they are fine with Commander players using cards as soon as we get them into our hot little hands. One of the first problems you’re probably aware of is that most removal spells don’t deal with planeswalkers. You still need to load up your removal package with card like Krosan Grip, Naturalize, Cindervines and other artifact / enchantment removal spells. 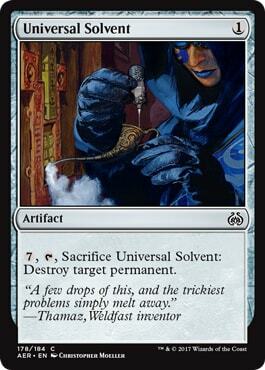 You never know when you’ll need to blow up a Doubling Season, a copy of The Chain Veil or an Indestructibility aura that some clever player attached to a planeswalker. You’re going to want to look for cards that will deal with specifically with planeswalkers or with permanents in general. It’s always better to have a broad solution because there will still be plenty of decks without planeswalkers to have to contend with. Some of these cards will deal with any permanent and some will be more narrow in their scope, but all should be capable of taking out an opponent’s planeswalker. I’m not going to include any cards that bounce a planeswalker to its owner’s hand, puts it on top of the library or even exiles it temporarily. Having a key planeswalker under an Oblivion Ring type of enchantment may be safer than having it in the graveyard for some decks, but I generally assume my opponents have ways to get rid of enchantments. I view those as temporary solutions and today we’re looking for more permanent ones. Some of you may be wondering what the need is for all of these “answer” cards. You can just attack the planeswalker with your creatures and kill them that way, right? You’re not wrong, but you also might not have the luxury of having the kind of army that can just swing over or through an opponent’s defenders and clear their board of all of their walkers. They may also be packing their own removal or even fog spells to frustrate those efforts. The other argument against expending too much energy on attacking planeswalkers is that you might do better to just engage in old fashioned “player removal”. Why keep chipping away at loyalty counters when you can simply kill their controller? Every game will dictate the strategy you need to employ and there is no one answer to whether it’s better to swing at a player or at their walkers. Keep a close eye on which ones are close to their biggest, most expensive loyalty ability and be careful not to let any of them get too many loyalty counters. The bottom line is that there is no easy answer, but there will be times when combat is the right choice and there will also be times - like after a boardwipe - when you will desperately need another way to get the job done. The cream of the crop for removal spells are almost always instants. The newest and possibly the best card in this list is Assassin's Trophy, in no small part because it costs a mere 2 mana ( ) to cast. Your opponent can tutor for a land, but if you’re choosing your targets well, that will be small comfort for what you took away from them. 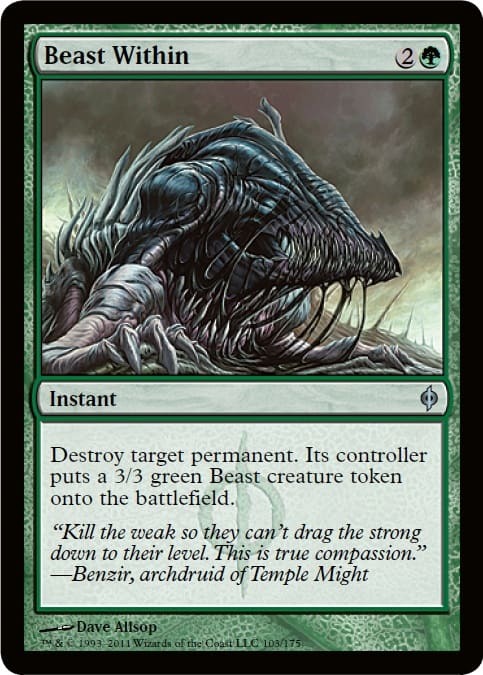 At , Beast Within costs one more mana and will leave your opponent with a 3/3 Green Beast creature token which they will happily use to block for their other planeswalkers. 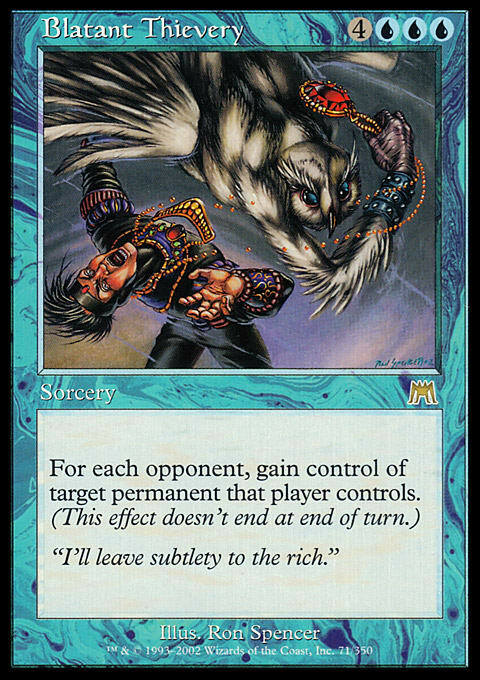 If you want to pay a little more to get a little more, you can cast Windgrace's Judgment for and destroy a permanent owned by each one of your opponents. The three mana Bedevil will let you destroy an artifact, creature or planeswalker, giving you some decent flexibility. Hero's Downfall only lets you target a creature or a planeswalker, but for three mana that is still pretty good. If you’re willing to pay five mana, you can cast the modal Silumgar's Command and get even more options. 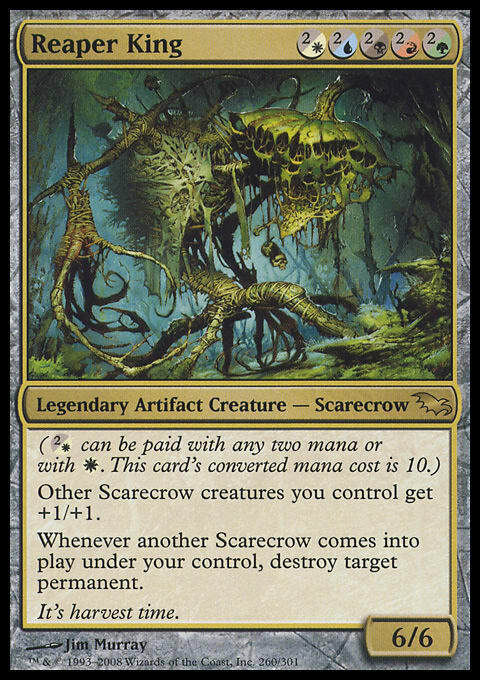 If you’re into weird old cards, feel free to look up Rootgrapple. 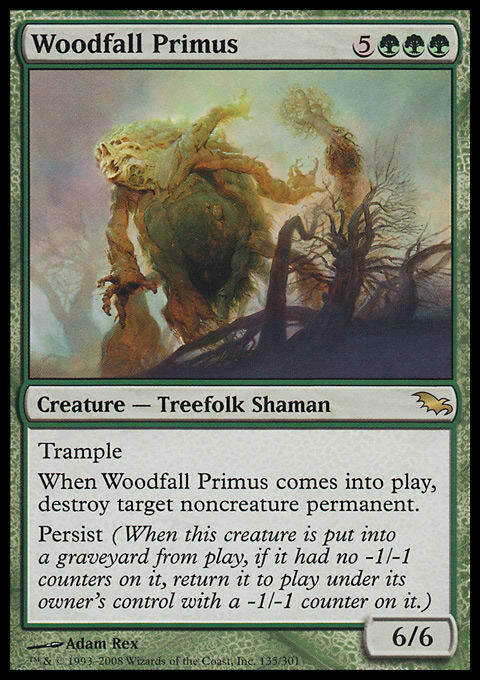 It’s an overpriced Mono-Green option that will destroy target noncreature permanent and also let you draw a card if you control a Treefolk. Got wood? Congratulations - draw a card! 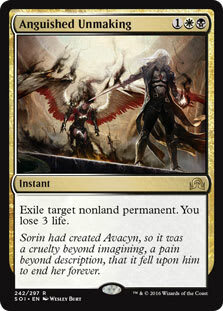 Destroying a planeswalker isn’t always a permanent solution, but exiling one usually is. Even a graveyard deck will have trouble bringing key planeswalkers back from exile. For three mana, Anguished Unmaking will exile target nonland permanent, but it will cost you three life. For one mana more, Utter End will just do the job with no extra pain for you. 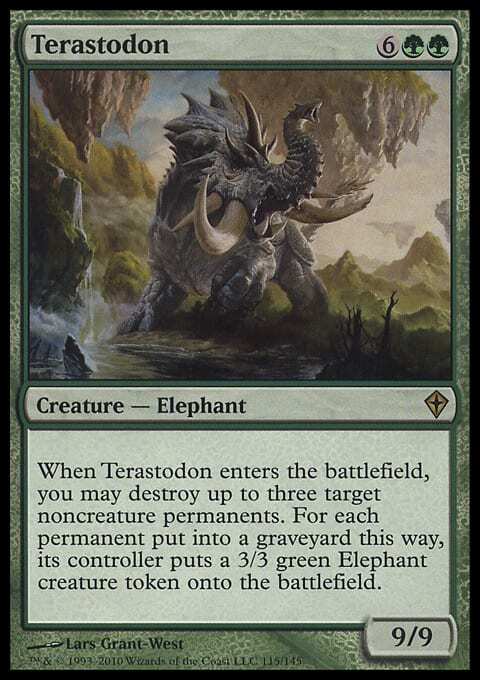 If you are willing to pay four mana, you can cast Vraska's Contempt and exile either a creature or a planeswalker and gain 2 life. If you’re overwhelmed by some of these color requirements, there is one instant-speed option you should know about that has no colors in its casting cost. Scour from Existence costs a hefty seven mana, but it will exile anything and can be played in any deck. You might think that Sorcery-speed answers are just not worth playing, but when dealing with planeswalkers the reality is that you usually don’t have to worry about them if it isn’t their owner’s turn. 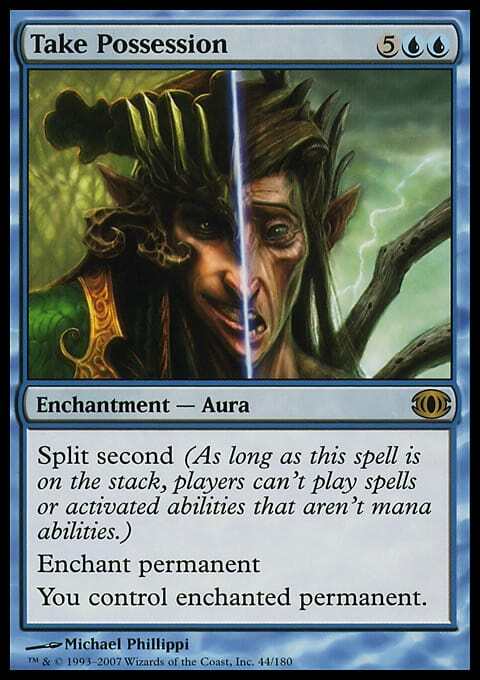 Unless an opponent has the emblem from Teferi, Temporal Archmage or they are messing around with The Chain Veil, they should only be using those loyalty abilities on their turn at sorcery speed. It’s also worth noting that when an opponent plays a planeswalker they can use its ability before you get the chance to respond. The exception to this rule occurs if there is an enter-the-battlefield (ETB) trigger that is put onto the stack as a result of the planeswalker entering. 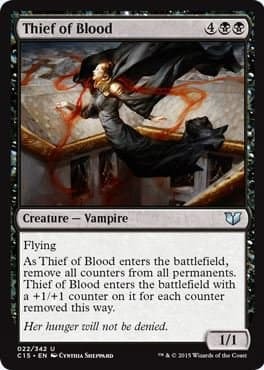 In that circumstance you can respond to the ETB trigger to play a kill or exile spell before the opponent gets the chance to activate the planeswalker’s loyalty ability. Instant speed removal is still incredibly important, but sorcery-speed answers to planeswalkers is absolutely playable. Let’s take a look at some of these slower answers. Vindicate is beautiful in its simplicity. 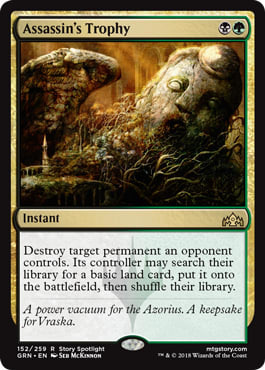 It will “destroy target permanent” for and that should do the trick to remove a troublesome planeswalker. 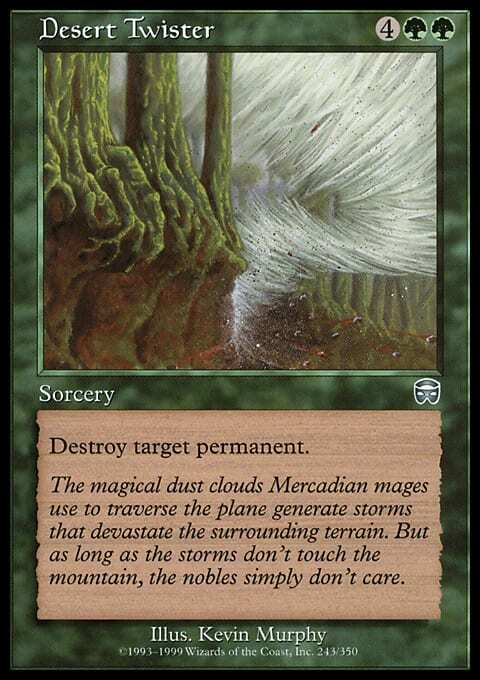 Desert Twister is obscure and overcosted, but it can be played in Mono-Green. 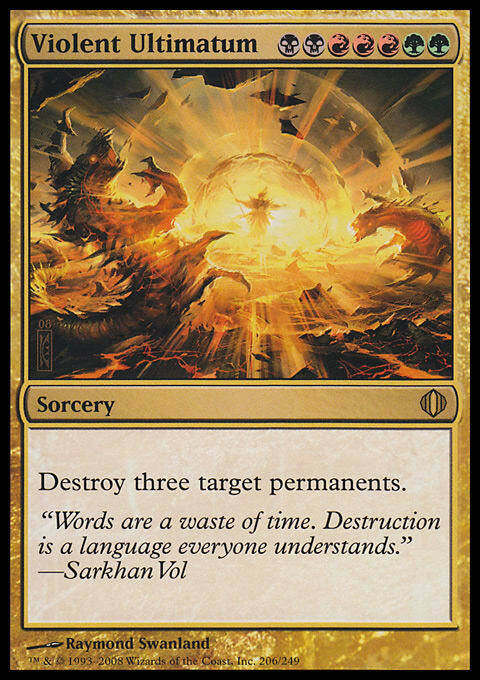 If your Superfriends opponent is really getting out of hand, Violent Ultimatum will blow up three permanents for seven mana. That should slow down even the best planeswalker deck. Most removal spells can’t be used on just anything, and the rest of these sorceries have some sort of qualifier to keep them from being too powerful. 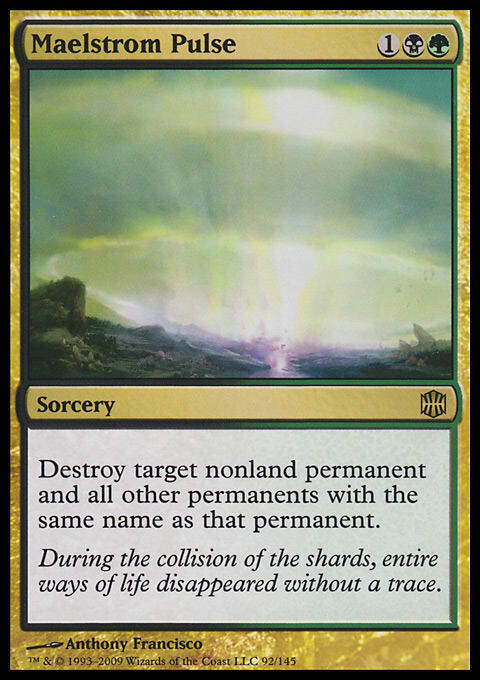 Maelstrom Pulse will destroy an nonland permanent and any other permanents with the same name as that permanent. While you can wipe out a token army or do fun stuff with Spy Kit, you’re usually just going to remove one target with a Maelstrom Pulse. 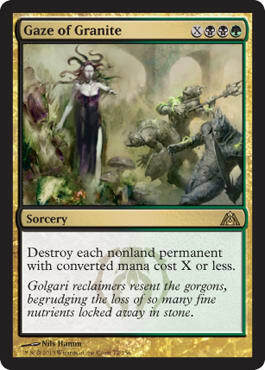 Gaze of Granite is another matter entirely, destroying each nonland permanent with a CMC of X or less, where X is the extra mana you throw into casting this odd little boardwipe. Chain of Acid targets noncreature permanents but it will only turn into a boardwipe if everyone at the table agrees to just keep copying it until there are no targets left. I’m sure that’s happened but I expect lots of players are like me and don’t like to copy it and keep the chain going. In Rakdos colors, Dreadbore will let you destroy a creature or planeswalker for just two mana. 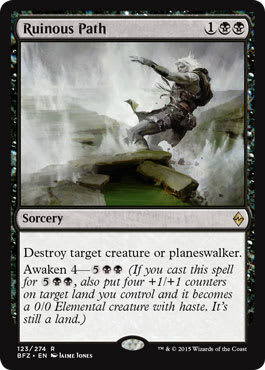 In Black for one mana more, Ruinous Path will do the same, and comes with the ability to be cast for its Awaken cost. That will let you put four +1/+1 counters on a land you control and turn it into a creature. Darksteel Citadel and Cascading Cataracts are good candidates for that if you don’t want to play Inkmoth Nexus and put someone on a two turn clock. Bramblecrush is a Mono-Green sorcery that will let you destroy a noncreature permanent for four mana. There are a few other options. 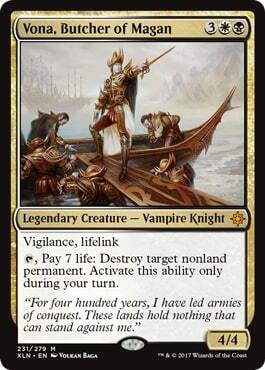 Never // Return and Yawgmoth's Vile Offering will work and anything that can do direct damage to a planeswalker has the potential to serve as removal if your target is low on loyalty. If you’re in the wrong colors or you have a colorless deck you might feel like you’ve barely got any options. Fortunately I’ve got a few answers to share with you in the artifacts category. Just because these are artifacts doesn’t mean they are easy options or are accessible to every deck. Of the first three artifacts I have for you, two have color requirements and the other requires you to attack with a creature. 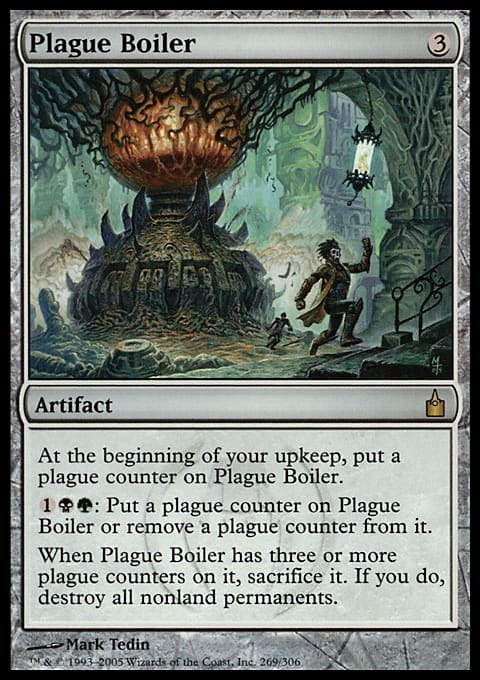 Plague Boiler will destroy all nonland permanents, solving your planeswalker problem but also the “problem” of your own nice little boardstate. 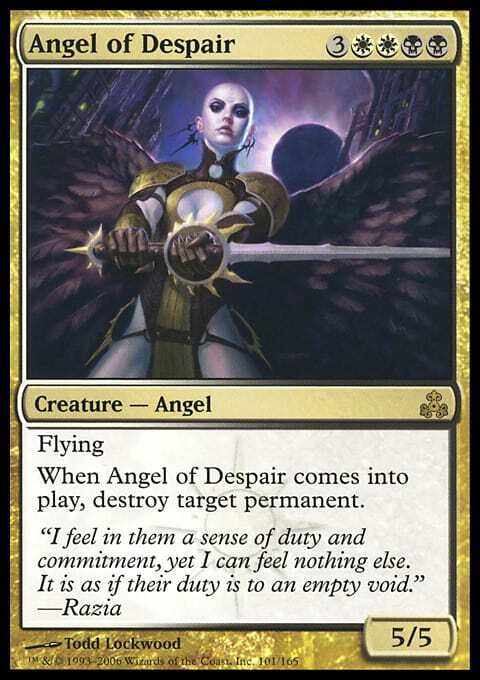 Pair this with Avacyn, Angel of Hope for maximum effect. If you’re in five colors you could run Legacy Weapon, though if you’ve got access to every color we’ve already established that there are cheaper, better options. Arguably none are cooler, but many are cheaper and better. For a removal option that can be run in any deck, try Argentum Armor. It is expensive to cast and to equip, but if a creature you control attacks with it equipped you will be able to blow up anything you want. 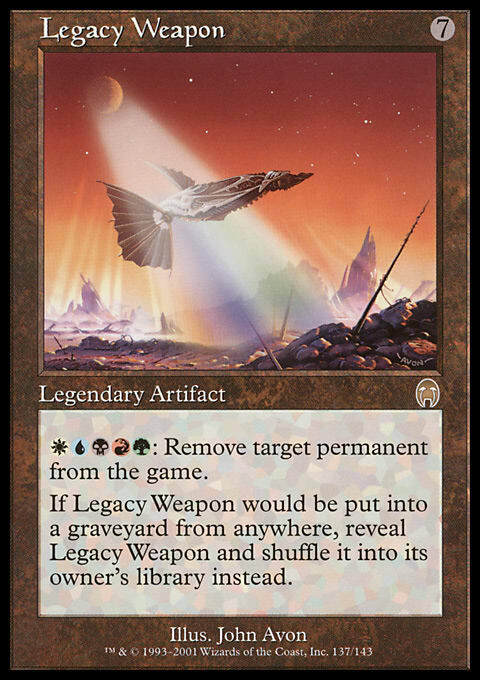 There are a few planeswalker death rays out there that you can put into any deck. 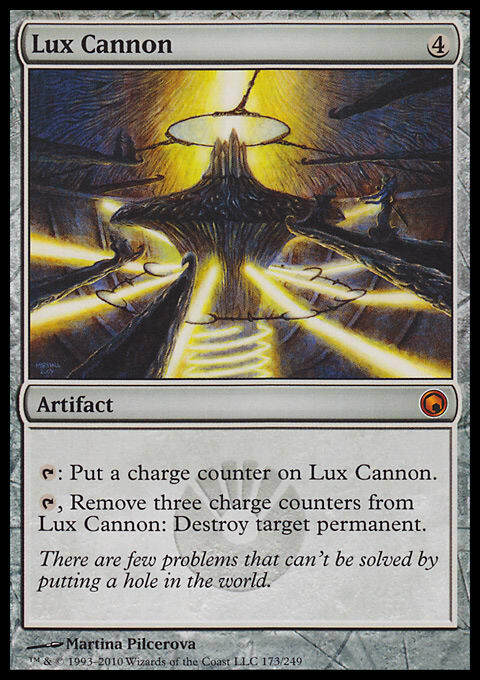 Lux Cannon has to be charged up, but if you have ways to proliferate or speed up how quickly it gains charge counters, it can put in some serious work. 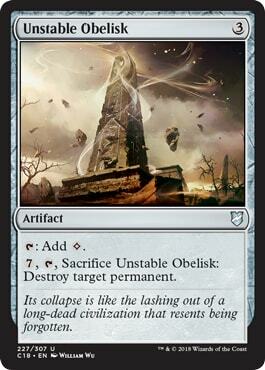 Unstable Obelisk and Universal Solvent have expensive activation costs and both force you to sacrifice them, so while they are serviceable they are not easily repeatable. 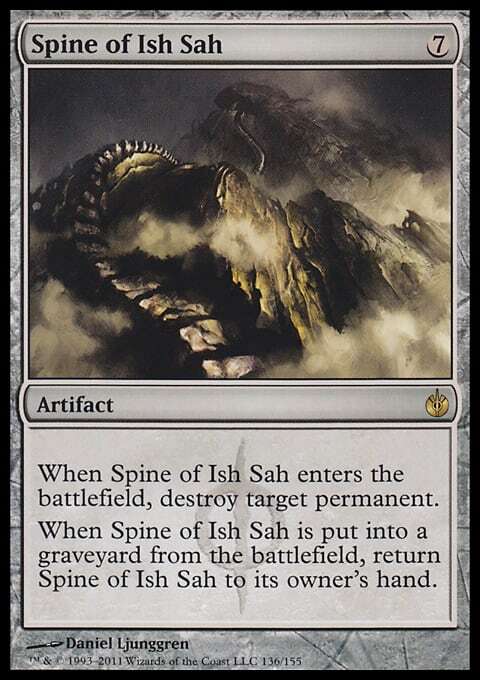 Spine of Ish Sah is expensive but it will destroy target permanent and if it goes into the graveyard from the battlefield you return it to your hand so you can use it again. What you do with it while it’s on the battlefield is another question entirely. 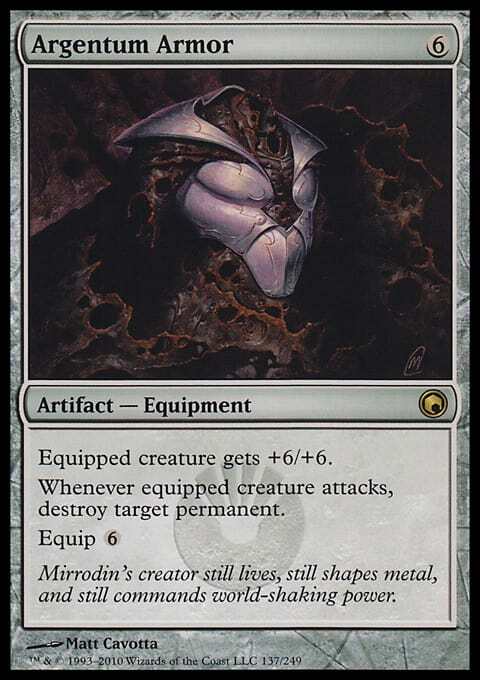 You could look at March of the Machines and Ensoul Artifact to turn it into a creature or turn to a commander like Breya, Etherium Sculptor or Bosh, Iron Golem if you really want to get the most out of Spine of Ish Sah. 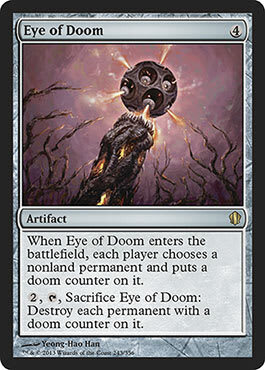 Eye of Doom is an odd little artifact that will let your opponents target your own stuff for destruction. It is probably best played when you’re behind in the game, but if you can get other players to work with you, it can really help to clear out the bigger problems on the board. 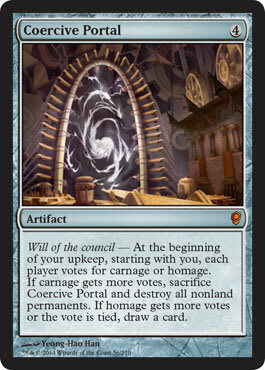 Coercive Portal is another option that will encourage table politics. On your upkeep everyone votes and if the majority wants a boardwipe it will destroy all nonland permanents. If the vote is tied or the majority doesn’t want to lose their stuff you get to draw a card. If we get to call creatures that tap for mana “mana dorks” I think creatures that allow you to blow stuff up should be called “removal dorks”. Maybe they already are. There are a lot of removal dorks that can target planeswalkers so I’ll try to go over some of the better options. These first three should be familiar to anyone who plays Commander. They all have their removal tied to an enter-the-battlefield trigger, so they’ll be great with a Panharmonicon on the field and a little less useful if someone has a Torpor Orb or Hushwing Gryff in play. 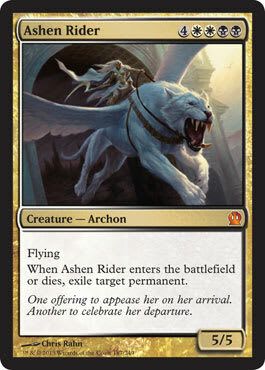 If you’re in Orzhov ( ) you can also run Angel of Despair or Ashen Rider. The former will destroy a permanent. The latter will exile one when it enters and when it dies. 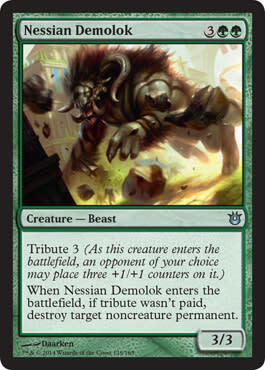 In Green, Nessian Demolok has the Tribute ability and if you can convince a tablemate to not pay the Tribute cost of putting 3 +1/+1 counters on it, you get to destroy target noncreature permanent. One last janky ETB removal dork worth mentioning is Mold Shambler. Hallar, the Firefletcher’s best friend is a Green Fungus Beast with a kicker cost that will let you destroy target noncreature permanent. There are removal dorks that don’t rely on ETB triggers. 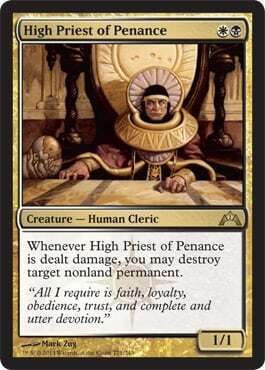 High Priest of Penance will let you destroy target nonland permanent when it takes damage and since it’s a 1/1, that will probably mean it’s going to die. 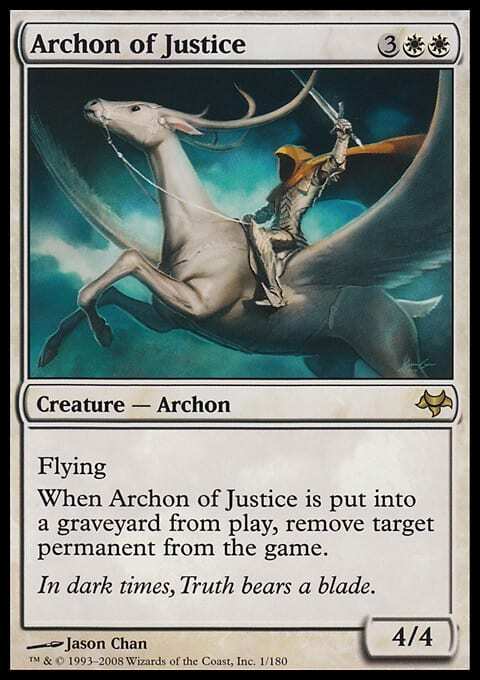 Destructor Dragon really does have to die to let you destroy a noncreature permanent and Archon of Justice will let you exile a permanent when it dies. If you want to see everything go away, you could just play and kill Bearer of the Heavens, but don’t expect that move to make you many friends. Before I touch upon legendary options, it’s worth noting that a Slivers deck with Necrotic Sliver will have the chance to have an army of removal dorks at its disposal. Another one to mention is the underrated Steel Hellkite. 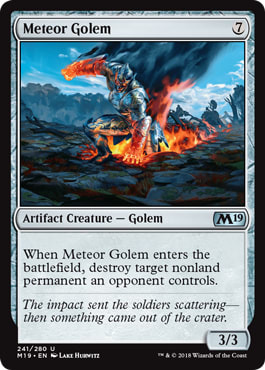 You have to deal damage and pay mana, but it’s an effective way to wipe out an army of tokens or a planeswalker and every other nonland permanent that player controls with the same CMC. If you really, truly want to make sure you have removal available you can just make sure it’s in your command zone. Reaper King will let you blow up a permanent when you play a scarecrow. 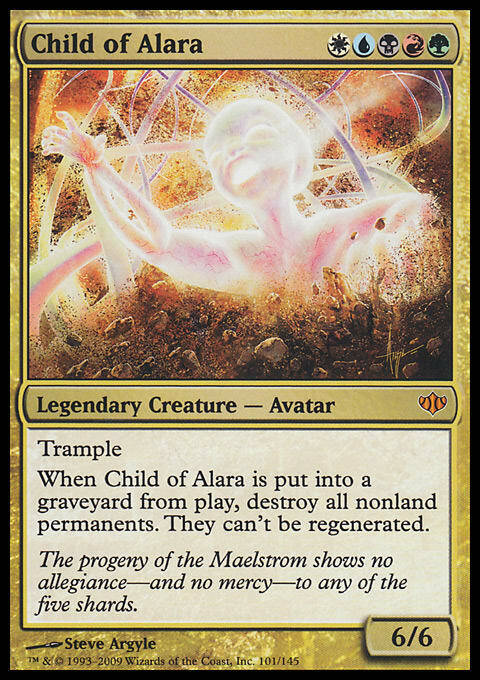 Child of Alara has to go to the graveyard, but will destroy all nonland permanents in the most epic of temper tantrums. 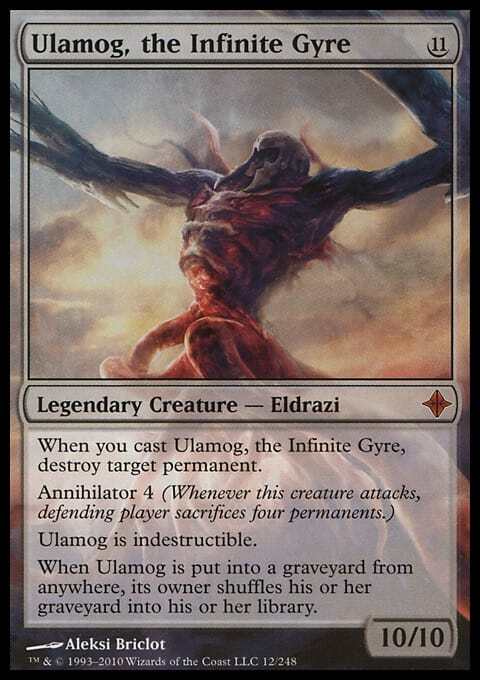 Ulamog, the Infinite Gyre lets you destroy target nonland permanent when cast, and his Annihilator 4 ability might wind up taking out a planeswalker or two when he attacks. 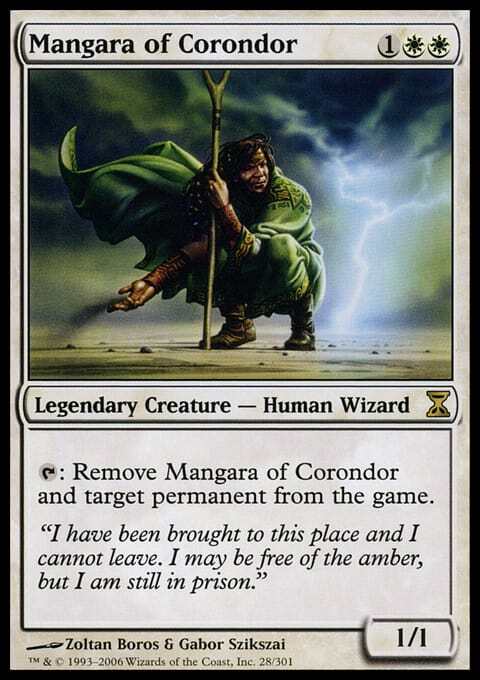 Ayli, Eternal Pilgrim lets you exile a nonland permanent and Mangara of Corondor lets you exile any permanent though he also gets removed from the game for his trouble. 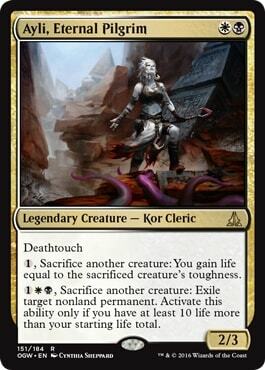 Vona, Butcher of Magan will let you destroy target nonland permanent at the cost of tapping and paying 7 life. More often than not you are going to be dealing with a planeswalker deck that is not in five colors. If your problem deck is one you regularly have to play against, it might be worth looking at answers that deal specifically with the colors that deck is in. If you’re in Red and playing against Blue you can run Active Volcano, Pyroblast, or Red Elemental Blast. In Blue against Red you can run Flash Flood, Hydroblast, and Blue Elemental Blast, though why you wouldn’t just run more counterspells is a question worth asking. White has the sorcery Saltblast, which will destroy target nonwhite permanent, and Celestial Purge, which will exile target Black or Red permanent. 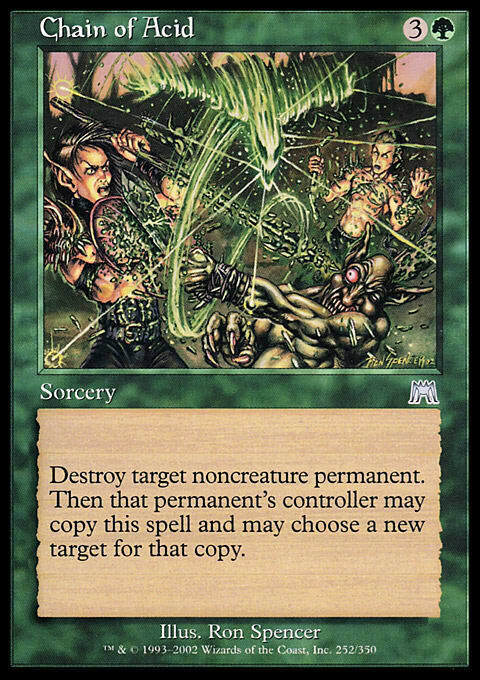 Green has Display of Dominance, which can destroy target Blue or Black noncreature permanent. 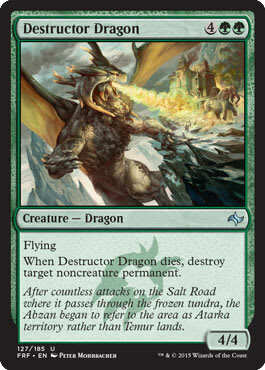 There was also a cycle of “Defeat” spells, each of which can destroy a creature or planeswalker. Chandra's Defeat is for Red, Gideon's Defeat is for White, Jace's Defeat is for Blue, Liliana's Defeat is for Black and Nissa's Defeat is for Green. 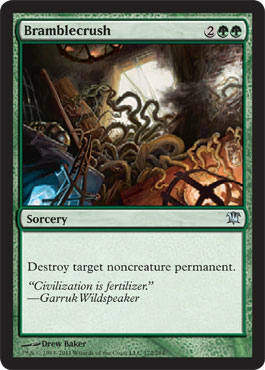 They are instants and can draw you a card if you blow up the named planeswalker, but they are a little narrow in scope. 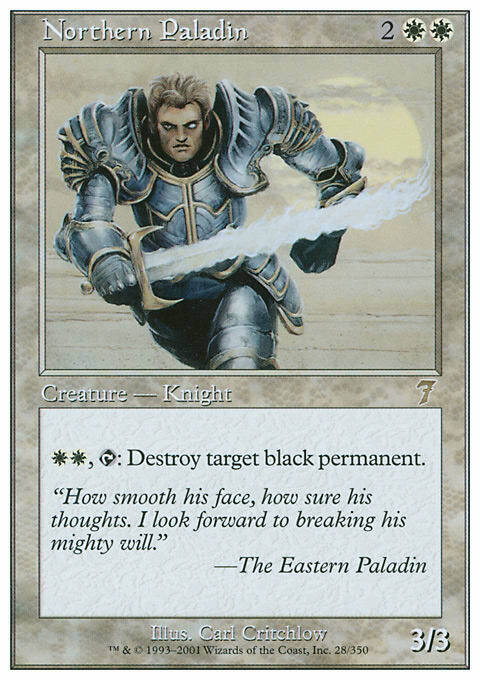 If you’re in White or you’re playing a Knight tribal deck, there are a few Paladins worth mentioning. 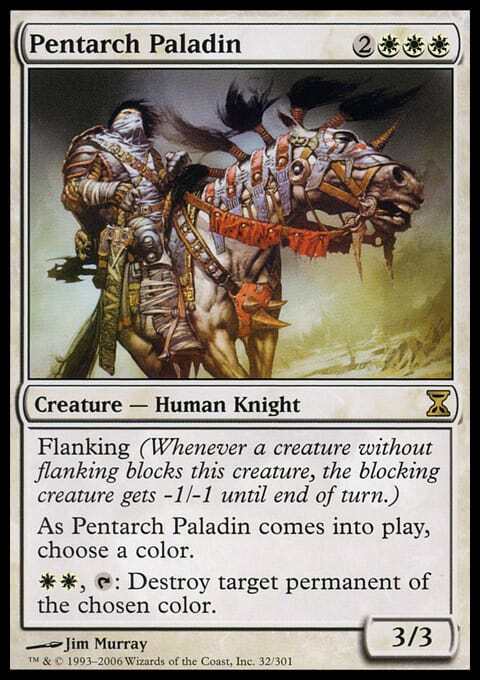 Northern Paladin can destroy a Black permanent, Southern Paladin can destroy a White permanent and Pentarch Paladin lets you choose a color and more importantly, has Flanking. It’s probably safe to say that nearly everyone’s meta could use more creatures with Flanking. If your problem is planeswalkers maybe the best option is to fight back with your own planeswalker. The War of the Spark may well bring us some planeswalkers with loyalty abilities that can deal with other walkers, but as of this writing Serra the Benevolent is the only one spoiled and she sure won’t get the job done. 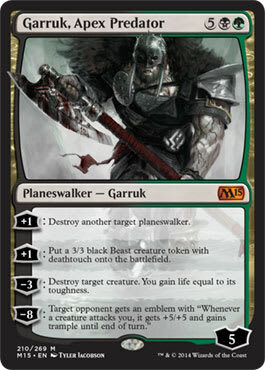 Garruk, Apex Predator lets you destroy another target planeswalker. 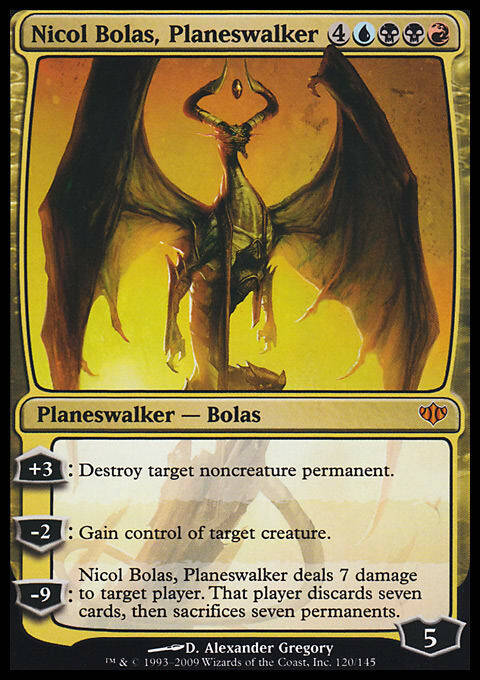 Nicol Bolas is slightly more flexible, letting you destroy target noncreature permanent. Garruk gains one loyalty counter for his services, while Nicol Bolas gains a whopping three loyalty counters. 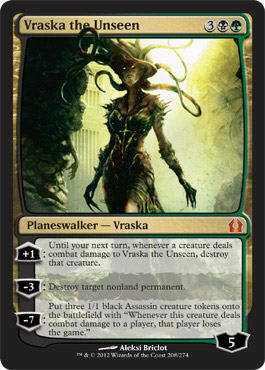 Vraska the Unseen will let you destroy target nonland permanent, but it will cost you three loyalty counters to do so. 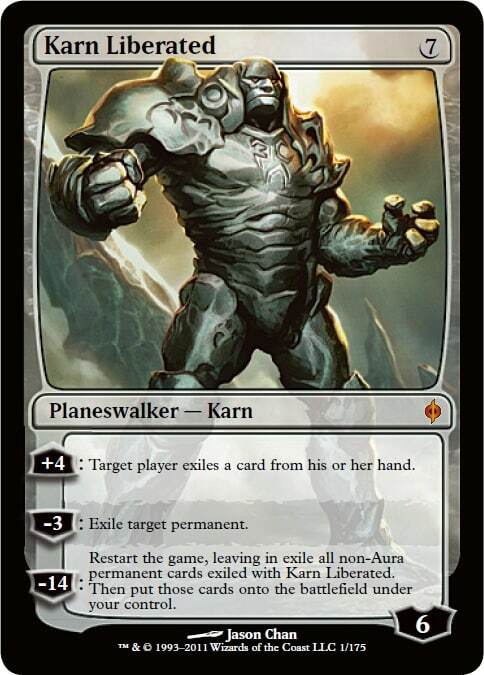 Karn Liberated will not only exile one permanent but can restart the game and give you all of the permanents you were able to exile at the start of that new game. 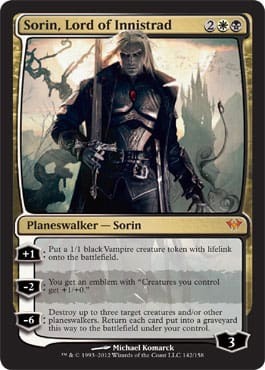 If you need to deal with more than one planeswalker, Sorin, Lord of Innistrad’s final ability will let you destroy up to three target creature and/or planeswalkers. 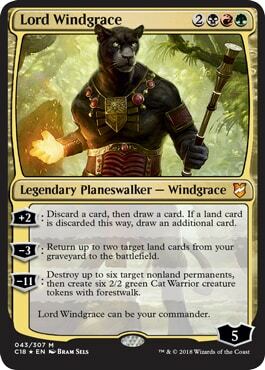 Lord Windgrace’s ultimate ability will destroy up to six target nonland permanents. Every deck should probably have ways to clear the battlefield, but not all boardwipes will touch planeswalkers. You’re going to want to run ones that will affect them because you can be sure the Superfriends deck will be wiping the board of creatures and leaving their walkers untouched. Merciless Eviction and Fated Retribution can both deal with planeswalkers and if you can get to nine mana, In Garruk's Wake will leave your own board intact. There are plenty of boardwipes in White that destroy permanents, ranging from Hour of Revelation and Planar Cleansing to Soulscour. In Red Star of Extinction will almost always do the trick, as planeswalkers pretty much never get over 20 loyalty counters. 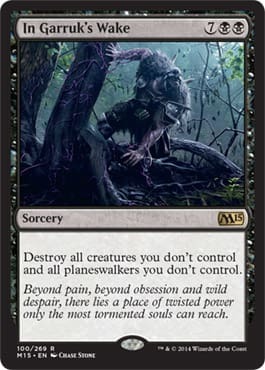 Attacking with a Worldslayer attached to a creature will also clear the board of planeswalkers (and creatures, and enchantments, and lands, and salt shakers, and napkins, and anything else that might be lying around). 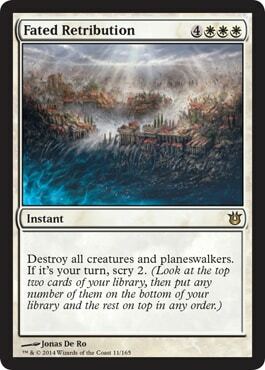 Last but not least, an overloaded Cyclonic Rift will put everything back in your opponents’ hands but don’t give someone the chance to replay a Doubling Season and a slew of planeswalkers because that probably won’t end well for you. Destroying and exiling planeswalkers might seem like an effective solution but if you’re in Blue the best answer might be to steal them right before they are ready to use their final ability. You let the Superfriends player do all the work for you and then you swoop in and reap the benefit of all their hard work. 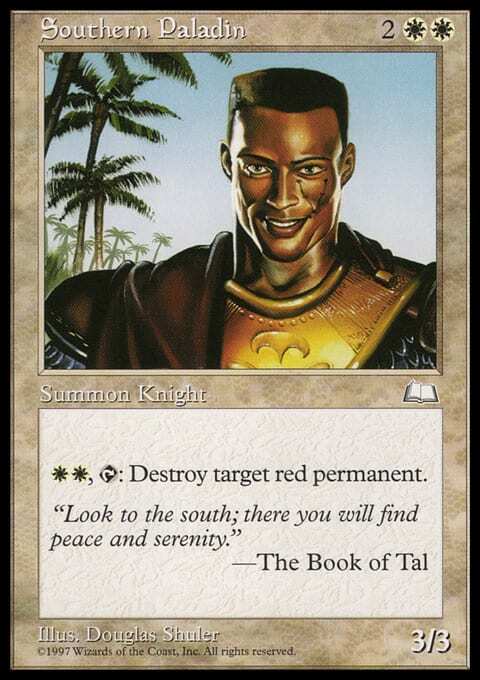 It’s worth noting that Take Possession can steal a planeswalker on an opponent’s turn before they can activate that planeswalker’s loyalty ability but you cannot respond to their activation of the ability to steal it before they use the ability. You can also use spells like Confiscate, Commandeer, and Spelljack to steal a planeswalker spell when it is put on the stack. You’ll have to put in the hard work to activate loyalty abilities and get it to the point where you can use its final ability, so it’s a little less spicy than just stealing it and ulting it. My favorite way to ruin a Superfriends player’s day is the following two card combo. I’ve never done it, but someday I hope to live the dream and play these two creatures against opponents who are running lots of planeswalkers. When Thief of Blood enters the battlefield, it will steal every counter from every permanent. 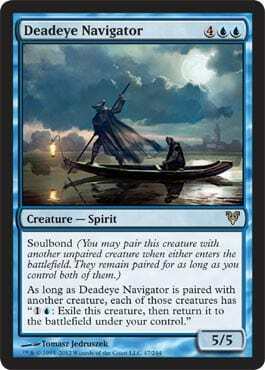 It’s got flying, so there’s a decent chance that you can hit someone for a big chunk of damage on your next turn but the real fun happens when you pair it with Deadeye Navigator and can instantly remove up any planeswalker (or 0/0 Hydra) that hits the field. If you can think of ways to remove planeswalkers that I haven’t included feel free to include them in the comments below. My goal was to be thorough but not exhaustive, but’s possible I’ve done both. If you build a deck with a ridiculous amount of planeswalker removal, please be considerate of your opponents and also include a way to end the game. 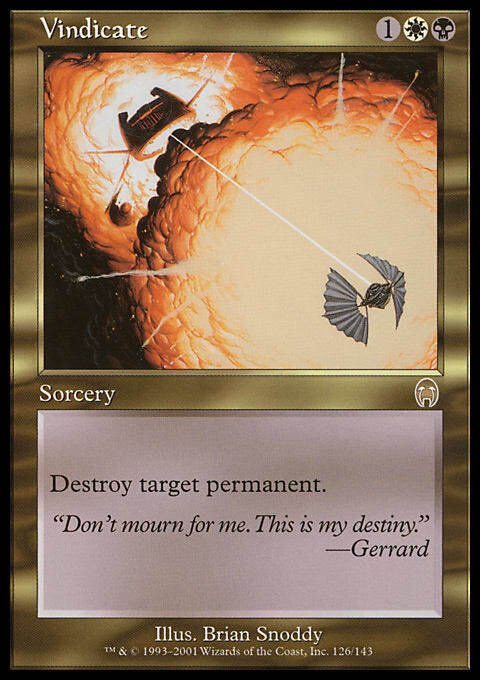 You can blow up everything again and again, up to and including lands if you really want to slow things down, but if you can’t actually win you may wind up with a bunch of friends who don’t invite you to play Commander very often. I have been working on a very removal-heavy deck as an experiment in playing more answers. I don’t tend to run as many as I should, and once I’ve played the deck a few times will probably share it with you in an upcoming column. Next week I’m probably going to take a look at the other side of this coin and talk about building and piloting planeswalker decks. That’s all I’ve got for you today. Thanks for reading and I’ll see you next week!